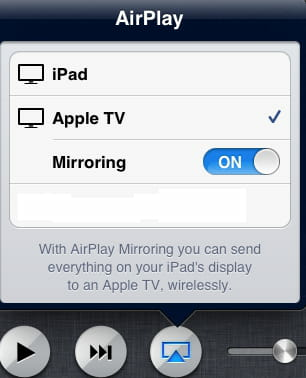 The AirPlay Mirroring feature allows you to duplicate the content displayed on your HDTV screen on other iOS device (iPod, iPhone and iPad) connected to the same Wi-Fi network, using the AirPlay technology. 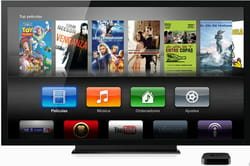 First you need to connect an Apple TV to your HDTV. Connect the Apple TV to your TV using an HDMI cable. On your iDevice (iPad, iPhone or iPod Touch) double tap on the Home button to display the list of recently opened apps. Swipe to the left until you see the Airplay icon. Click on the AirPlay icon, then select Apple TV and activate "Mirroring". Published by deri58. Latest update on July 31, 2013 at 06:26 AM by deri58. This document, titled "Apple TV: View your content on multiple screens," is available under the Creative Commons license. Any copy, reuse, or modification of the content should be sufficiently credited to CCM (https://ccm.net/).